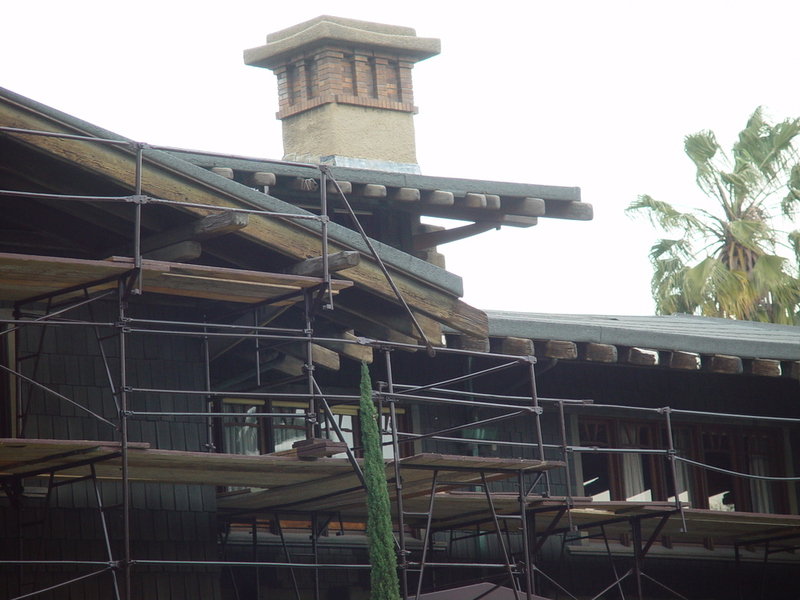 By 2003, many of the exterior wooden elements at the Gamble House were dried, deforming, and losing fibers (i.e. the shake siding, exposed beams, and railings). In addition, some wooden members were suffering from dry rot and termite damage (i.e. the rafter tails). These conditions had not gone unnoticed by the Gamble House director and the foundation board. In fact, material conservators, including the Getty Institute, had studied alternate repair methods for nearly 10 years before finalizing the specifications. During the five years prior to the initiation of repairs, California Restoration & Waterproofing, The California Restoration Specialist TM, worked with the Gamble House staff to create a meaningful budget, which in turn was used to raise funds through grants and donations. California Restoration & Waterproofing worked exclusively as the specialist subcontractor for wood repairs and complete near perfect repairs to the damaged areas of the Gamble House while undergoing daily inspections by material conservators, restoration architects, the general contractor, and the house’s staff. The restoration goals were to arrest the exterior deterioration and leave the wooden elements in a healthy state to be monitored and managed by future generations. Our tactical goal was the stabilization of damaged wooden materials in order to save as much of the original wood as possible. We were allowed only to remove fragments already turned to dust or contaminated with mold that could not reasonably be saved. Working together with the materials conservator, we climbed the scaffolding and surveyed the various conditions at the beams, tail rafters, windows, sills, and shake siding. Next, we produced samples at the direction of the conservator to demonstrate the construction techniques to be used to repair each element. Once the overall project began, our work at the tail rafters, for instance, included cutting out the damaged and excessively rotted wood by hand. We then treated for dry rot spores. This was followed by the application of resins to stiffen the adjacent and damaged soft wood fibers. The patching then proceeded using compatible wood epoxies together with aged wood blocks as interior filler material. We then carved the outer surfaces of our patches to follow the original lines and contours and to simulate the deep-weathered grain. Finally, we applied wood preservatives and stains to blend the repairs into the adjacent untreated surfaces. Architects Charles and Henry Greene designed the Gamble house in 1908 for David and Mary Gamble. David was the son of James Gamble, co-founder of the Proctor and Gamble empire. Working in the arts and crafts style, the architects incorporated natural materials such as wood, stone, and brick with a seamless flow, transforming the pedestrian bungalow into high art. The architecture team consequently became America’s pre-eminent residential architects of the 20th century.